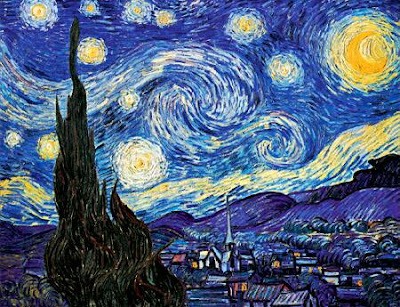 Vincent Van Gogh happens to be my favourite atrist. No wonder I love listening to Don Macleans Starry, Starry Night so much. Some times, when I look at his paintings in blues and yellows, the colours seem to spill over and colour my life in shades of the Sun Flower or the Irishes. I regale in the most Van Goghesque maddness of colours. Some times you don't need a brush to paint your life....you are enough! All of us have a madness within us. All of us have a Van Gogh. Are you in touch with the Van Gogh within you?